This being Halloween, I think that I can safely admit that more often than not, I cheer for the villain. Think of the best horror and sci-fi films, almost everyone that comes to your mind has an iconic villain. Same goes for the best video games, what would Zelda and Mario be without Gannon and Bowser? 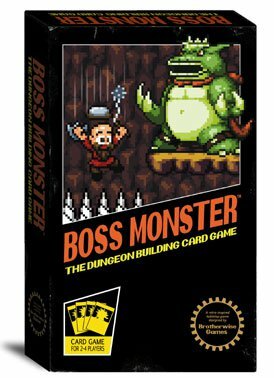 Boss Monster let’s you re-live those days from the villain’s perspective. This is a quick card game, and allows you to punish those meddlesome heroes for trying to steal your treasure. Setting up and playing your first game is going to be the hardest part of Boss Monster. There is a lot to take in quickly, and the game doesn’t pull its punches. The game has a couple different kinds of cards: Bosses, Rooms, Spell, Heroes and Epic Heroes. Each player takes a random Boss. This is now you, and each of the various bosses has a different treasure type and XP level. More on the treasure type later, but the XP simply determines who goes first. After that each player gets five Room cards, and two spells. You then discard two of these cards in any combination, and move on to build your first room. Rooms come in three types: Monster, Trap, and Advanced. Advanced Rooms replace existing rooms in your dungeon, but do much more damage. At this point, someone who has played the game can come in handy, as the imbalance between the first few heroes you draw and your early rooms can be daunting. Each player can only allow themselves five wounds, so it makes sense to be paranoid. That concept leads right to our Hero cards, the heroes come in five types: Warriors, Mages, Thieves, Clerics, and a Fool. (The Fool is singular because it’s an almost freebie given to the person losing the game.) Each of the hero types correspond to treasure types on your room, as well as your boss card. You then attack the heroes based on what treasure types you have, if players are tied for a type or no one has any of that type available, the Heroes don’t enter any dungeon and wait for the next turn. Players then build their second room, based on the heroes they think they can beat. Each hero you defeat nets you one soul; ten of those and you win. If heroes make it through, you get a wound; five of those and you lose. I’ve neglected the spell cards, but those are instant effects that vary from card to card. Trying to walk through the game is the best way to explain it, but it’s charm is almost entirely tactile in nature. All of the art is an excellent tribute to 8-bit video games, and the card text has a wry sense of humor. The game allows you to play from two to four players, and adjusts by removing some of the heroes and reducing the number of heroes drawn per turn. The heroes deck is limited and once it is deleted you get to the Epic Heroes. These feature higher health than normal heroes, which speeds up play pretty quickly. If I had a complain about this game, it is that often you end up with huge bottlenecks of heroes as everyone ends up tied in their treasure types. When someone finally breaks that bottleneck, it can end the game in a pretty anticlimactic turn. Once you’ve played this game for some time, you can pay advanced mode, which removes all of the lower health Heroes, which makes those early rounds really dicey. This game is really simple once you make it over that hump, and the play has a really quick cadence. This is a nice opening game for game night, or a nice companion with Munchkin and Gloom for a night of quick games. You can check out more about Boss Monster here. We had a heck of a learning curve with Munchkin, but getting “over that hump” it’s now a favorite in the house and we have bought more versions & expansions. This looks fun. I love Munchkin. I have a host of these quick little card games, like Gloom, Let’s Kill, the first Penny Arcade card game, and the Paint the Line Card game. They’re great for quick games. Though the last two are two player only.